Open Access week is a great reason to celebrate ERA, the University of Alberta’s well-established open access digital repository. We’ve just launched ERA’s fresh new design and improved infrastructure, and invite you to explore the over 36,000 items in ERA’s collection at http://era.library.ualberta.ca. ERA supports open access by providing a place for faculty to deposit their research and make it available to the rest of the world. Archiving in ERA is one easy way for researchers to meet new Tri-Agency requirements for open access as many publishers allow post-review articles to be shared through digital repositories. Sharing research broadly through a repository can increase its impact and reach, while also showcasing the work of research groups, departments, and teams, as well as students. ERA is more than just software; our institutional repository staff will help you deposit your materials in ERA: Education & Research Archive. If you forward us your CV, we can deposit items on your behalf through our mediated deposit service, or you can deposit your items using an easy self-deposit process. Send us an email at erahelp@ualberta.ca to get started! The new framework for ERA is built on Hydra, an open source software developed through the collaborative efforts of a number of institutions, including the University of Alberta. Together with our partners we are contributing to the development of better institutional repository solutions for organizations across North America and internationally. Moving ERA to the Hydra framework is an important step towards providing a more sustainable and stable approach to managing the Libraries’ diverse digitized collections. We expect ERA to grow dramatically in the future as we begin incorporating collections like Peel’s Prairie Provinces and The Sir Samuel Steele Collection into the same framework. We are also very excited to begin work to support different kinds of digital content in ERA, such as audio and video files. Take a few minutes to explore the new ERA at https://era.library.ualberta.ca. Contact us with any questions at erahelp@ualberta.ca. We also invite you to help us continue to improve the usability of ERA by suggesting improvements, or by volunteering to participate in our frequent user testing. <odesi>, a web-based data exploration, extraction, and analysis tool, lets you search for survey questions across thousands of datasets held in a growing number of collections, and supports basic tabulation and analysis online. It also allows for the downloading of most datasets into statistical software for further analysis. Statistics Canada: Public-use microdata files (PUMFs) and aggregate data products made available to subscribers of the Data Liberation Initiative (DLI). Data includes socio-economic indicators, business and financial databases, census microdata and aggregate data, social surveys, education, crime, health, and more. Public Opinion Polls: Historical Canadian public opinion polling data from Gallup. Other Canadian Data: Studies from other Canadian data sources, including the Canadian Millenial Scholarship Foundation, the Canadian Policy Research Network, and the Institute for Social Research. CORA: Researcher data and surveys from the Canadian Opinion Research Archive. ICPSR: Metadata from the Interuniversity Consortium for Political and Social Research. Note that while the metadata is available to everyone through <odesi>, only some schools will have access to the actual data files. These must be accessed through the ICPSR website. Links are provided where possible. <odesi> is always expanding its survey data to include other national and international data sources. <odesi> can be used for all types of research; some example topics include education, health, the environment, social, and economic well-being of populations within Canada and abroad. In <odesi> it is possible to build charts, tables, look at trends over time, and produce correlations. 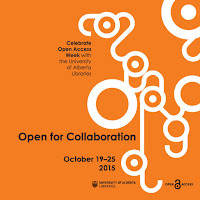 Access <odesi> through the University of Alberta Libraries web site. Request an appointment with one of the members of our Data Library to get help using <odesi>. Open Access Week is a global event that runs from October 19 to 25 and is intended to highlight the Open Access Movement, which encourages unrestricted online access to research. Traditional models of scholarly publishing keep research publications inaccessible behind costly subscription fees, requiring researchers and students to be affiliated with large academic institutions to gain access to them. With the shift to electronic publication in academia over the last twenty-five years, there is a growing consensus that the restrictions of the old publishing models are no longer conducive to nurturing research. The cost of academic journal subscriptions is also becoming a large monetary burden on institutions as they work to provide their scholars with access to the information they need. The Open Access Movement encourages journals to publish their content online so that it is freely available to everyone, increasing the exposure of the research it publishes and advancing the overall impact of the scholarship. This past year was a particularly big year for open access in Canada with the announcement of the Tri-Agency Open Access Policy on Publications. The three largest federal research funding agencies in Canada imposed a new policy, whereby any research funded by these agencies will have to be made freely available either through an open access journal or online repository within twelve months of publication. 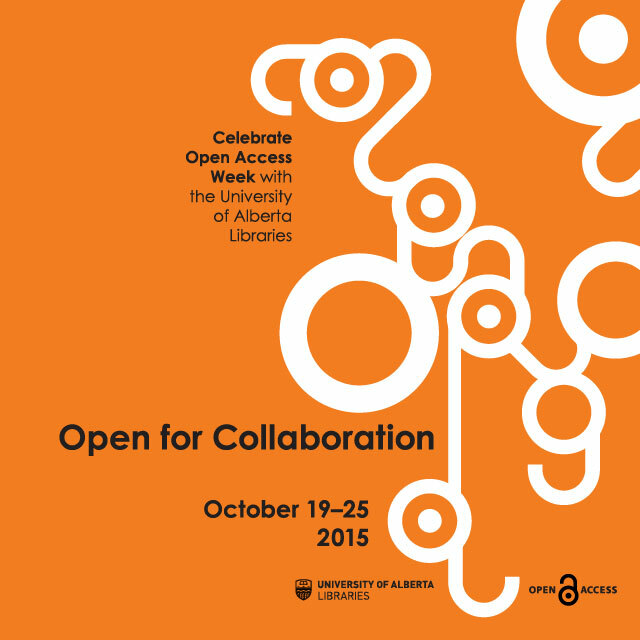 The University of Alberta Libraries is a strong proponent of the Open Access Movement. To celebrate the spirit of open access, librarians from the libraries' scholarly communications working group have engaged with design students to create an interactive exhibition in the Rutherford Library Galleria. This collaboration has grown over the past three years between the Libraries and the Department of Art and Design. It provides the Libraries with a way to connect with students, and to communicate issues around scholarly publishing. Students are introduced to the concepts of open access and then encouraged to produce installation pieces that express the movement. Past exhibits have featured large tape-art works, floor mazes and post-it note walls where the community could publicly write their about their views on open access. This year's exhibition theme is "Open for Collaboration" and will feature ten large interactive installations made by students in DES 493. Works will include optical illusions, a Newton's cradle, a massive Rubik's cube and much more. The exhibition posters and graphics were designed by design student Yang Lan Tian Zhang. The Libraries welcomes the community to a reception in the Rutherford Galleria on Tuesday October 20 at 6:30 pm to launch the exhibition. This year marks the 350th anniversary of the creation of the first scientific journal. After coexisting alongside correspondence and monographs, journals became at the beginning of the 19th Century the fastest and most convenient way of disseminating new research results, and consolidated this position throughout the 20th Century, especially in the sciences. The advent of the digital era, 20 years ago, challenged their traditional role and form. Indeed, digital technologies, which are easy to update, reuse, access, and transmit, have changed how researchers produce and disseminate new knowledge, as well as how it is being used. 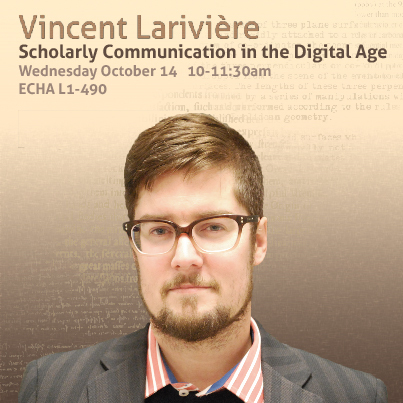 Drawing on historical and contemporary empirical data, this talk will address the past and current transformations of scholarly communication, with an emphasis on how these have affected the speed of diffusion of knowledge. While common wisdom suggests that science and scholarship is diffused—and gets forgotten—faster, the reality is more complex… and much more interesting. Vincent Larivière holds the Canada Research Chair on the Transformations of Scholarly Communication at the Université de Montréal, where he is associate professor of information science. He is also scientific director of the Érudit journal platform, associate scientific director of the Observatoire des sciences et des technologies (OST) and regular member of the Centre interuniversitaire de recherche sur la science et la technologie (CIRST).Vincent holds a bachelor’s in Science, Technology and Society (UQAM), a master’s degree in history of science (UQAM) and a Ph.D. in information science (McGill), for which he received the 2009 Eugene Garfield Dissertation Scholarship award.